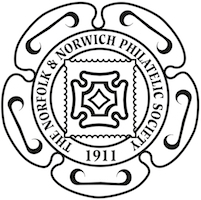 Norfolk & Norwich Philatelic Society: meetings, contacts. Stamp fairs are held in April and August, and the Society has a well-used library. The annual subscription is £5 (Associate members £1) due on 1st September. Please note the Centenary pages are not been updated since October 2011. The club operates very active sales circuits for foreign, and GB & Commonwealth stamps and postal history. Books on the circuit are compiled not only by our own members: we welcome contributions from non-members in all parts of the country. Please contact the Superintendent for details. Norvic Philatelics for all the latest news on new Great Britain stamps and postmarks, postal history, and online shop.